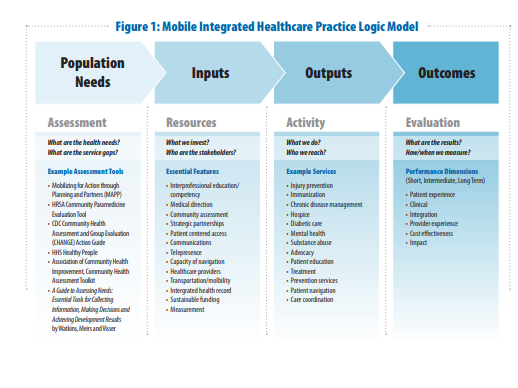 Earlier this month I linked to Episode 5 – Mobile Integrated Health/Community Paramedicine Featuring Dr. Peter Antevy From MCHC Paramedic Podcast With An Additional Article, posted on March 16, 2019 by Tom Wade MD. In the podcast, Dr. Antevy discusses a new Emergency Medical Services model. The post has links to his great podcast on the subject and contains an article that introduces the subject. For the very latest on Mobile Integrated Healthcare/Community Paramedicine see Mobile Integrated Healthcare from The Journal Of Emergency Medical Services (JEMS) And see also MOBILE INTEGRATED HEALTHCARE NEWS also from JEMS. What follows is an additional link on the subject. that MIHP could be funded within one of these models as a cost-optimization strategy based on shared savings. of health data on specific known health or social issues, by identified gaps in current services, and the insights of stakeholders, including patients and their families. 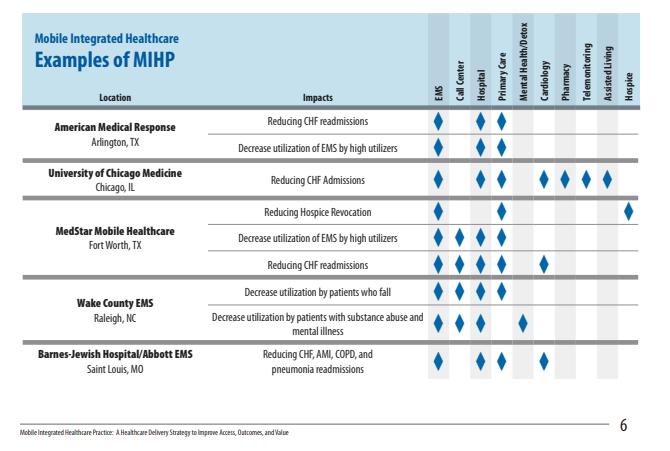 well suited to host the MIHP and coordinate service delivery by multiple providers. This entry was posted in Business, Business Of Healthcare, Clinical Research Methods, Emergency Medical Services, Health Services Marketing, Healthcare Economics, Healthcare Planning. Bookmark the permalink.